It is going well with the replacement of the bridge deck, partly through the work of our volunteers. Six days a week, there are at least two volunteers on board to assist with the various jobs. After the wood of the old bridge deck was removed, the people of shipyard De Haas Maassluis could replace steel, where necessary. The chipping and conserving was done by our people. In recent weeks, the carpenters of Shipyard De Hope also have been busy. 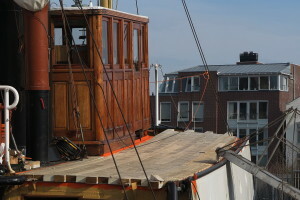 The preserved wood has been fitted on both port and starboard side. Currently they are working on the part in front of the wheelhouse, after which the joints between the wood will be sealed in the traditional way with tar and hemp. After this is done the Furie will go on the slipway, with the aim to clean and preserve the underwater hull. All in all we hope to return in April / May to our familiar berth at the Stadhuiskade.